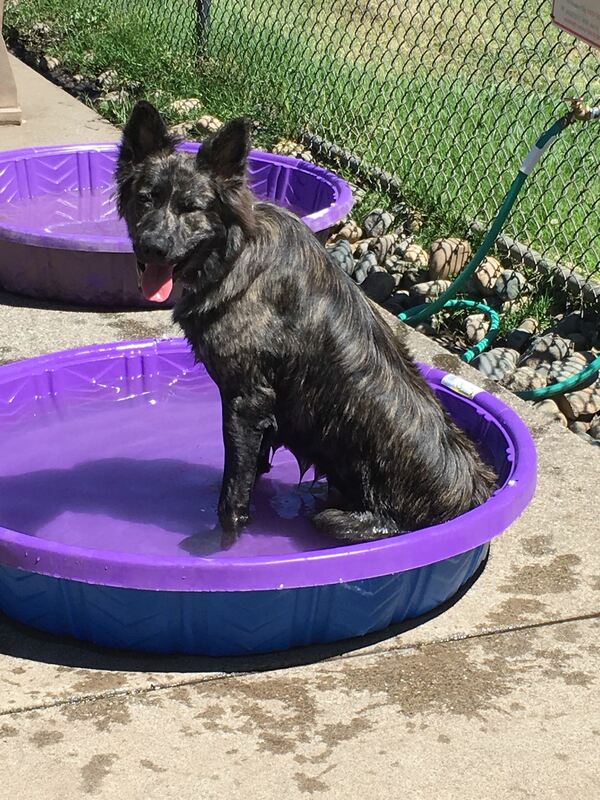 Board index Dogs Is my canine a Dutch Shepherd? 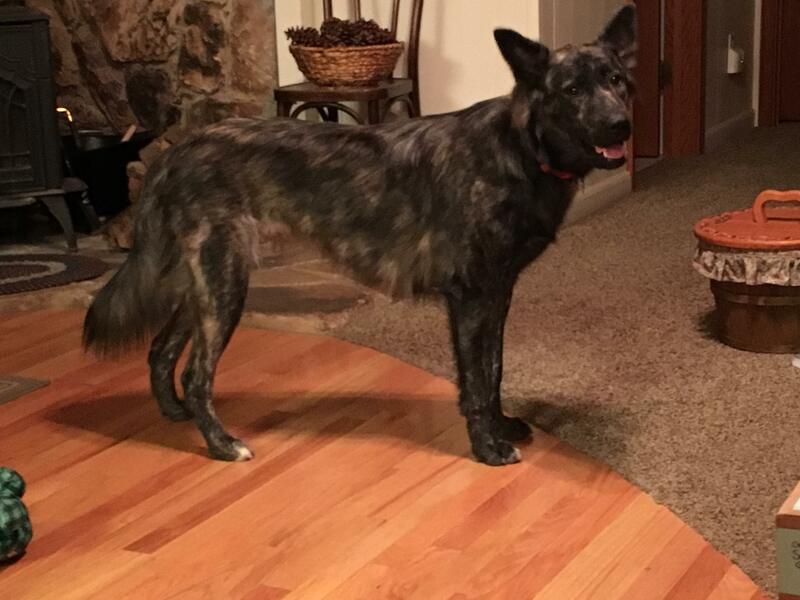 Is our Lucy a Dutch Shepherd?? 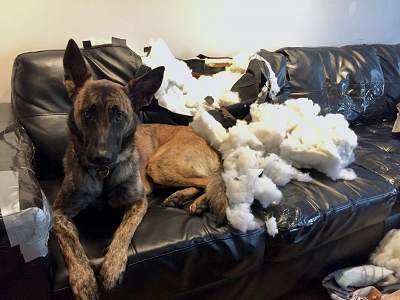 Wondering if that new friend you just brought home is a Dutch Shepherd? Post here. 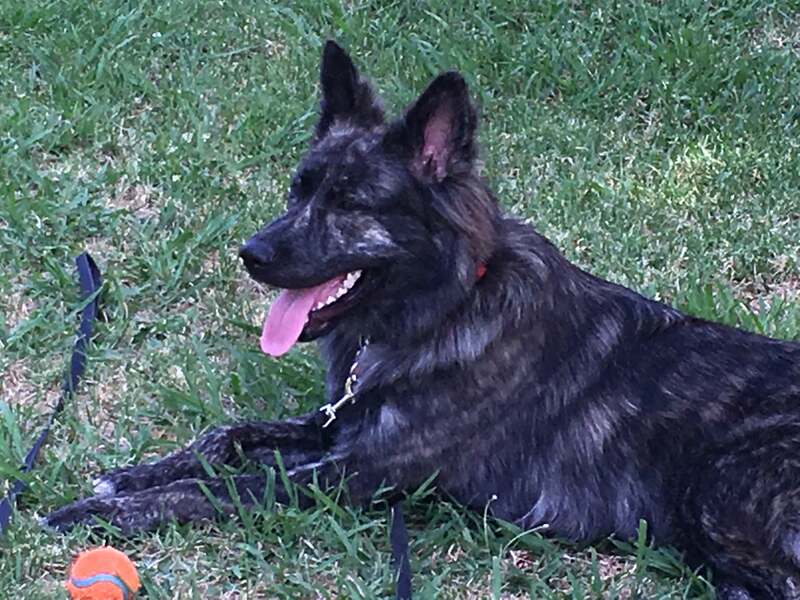 Please read the first post: "Forum Rules and FAQ"
Tell us about yourself: Husband & wife with rescued long hair dutch shepherd (mix?) at approximately 3 months old, now 11 months old. Sweet as pie! Our Lucy is a rescue dog from a field in the Sacramento area. She was approximately 3 months old when she was found by a friend of our neighbor. She is now 11 months old and just finished her first heat. We will spay her soon! She is smart and has an incredibly sweet temperament. We thought she was “maturing”, but when we treated her skin problem (food allergies?) her puppyness came back : ) Her brindle is blothchy in some areas and stripey in others. 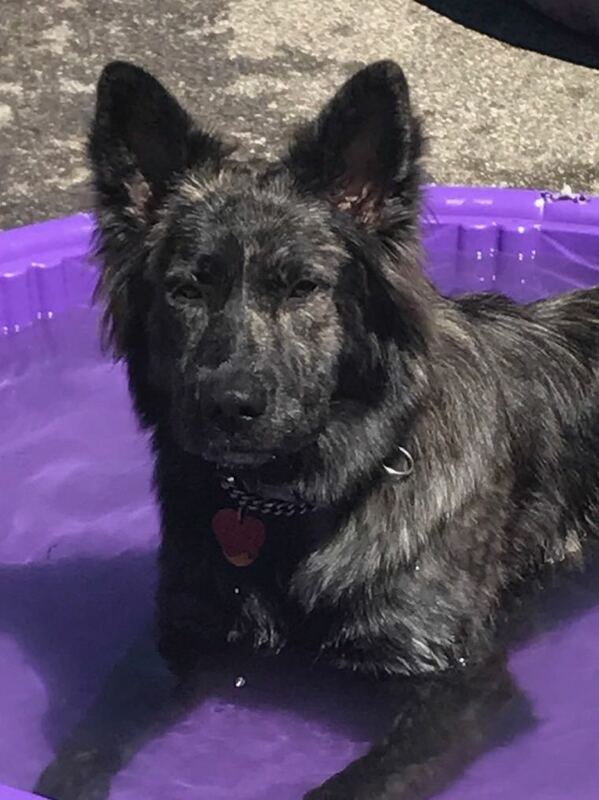 We love the “fluff” around her ears and don’t know if that is a Dutch Shepherd characteristic with long hair varieties? Her length is 40” from nose to tail base. Her height at the shoulder is 26”, and to top of head is 36 1/2”. She weighs 73 1/2 pounds. Lucy is very strong, likes to run and chase balls but is not as good at bringing them back. She seems to tire out quicker than I would expect, but it’s been really hot here this summer and she doesn’t like the heat. She does seem to like water. 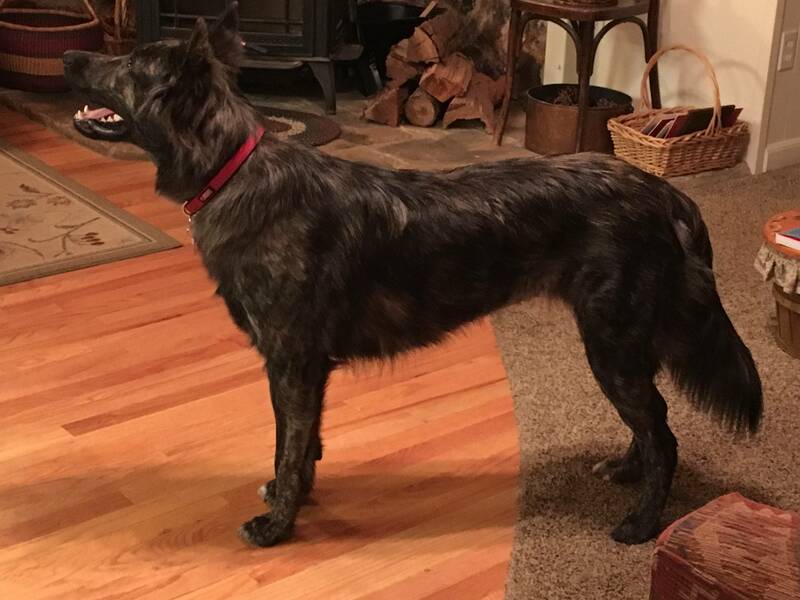 Re: Is our Lucy a Dutch Shepherd?? Lucy is absolutely gorgeous. Thank you for rescuing. 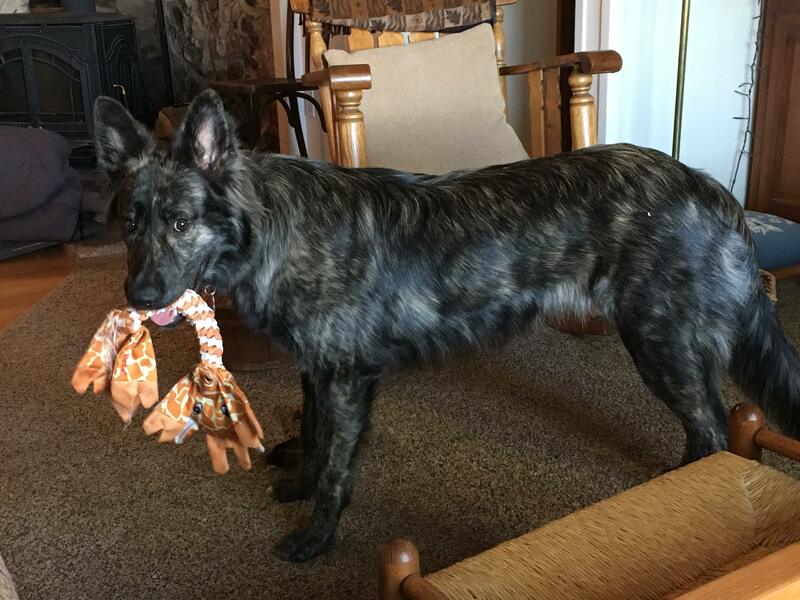 I don't think there is any Dutch Shepherd, however. The deep chest, the slight rounding of the ears, and the head shape all seem to point to something else. Of course, visual id is always a tough call. It sounds like you got a great dog, though. Tell us about yourself: Own two Dutchies and a Mal. Her size is a little large for a female which tops out at around 23.5" and 70 pounds. Until she's full grown you won't know for sure. Plus there really aren't any long haired Dutchie breeders in the states- at least not enough to where you'd just "find" one. Thank you for the replies, and also for your reasoning behind the replies. Very helpful Now we’ll have to just go with “shepherd mix” I guess when people ask. While there aren’t any long-hair breeders, one of the more popular sires (frozen sperm shipped everywhere) here in the states has a recessive long-hair gene and has thrown out some long-hair pups. That being said, I agree that the headshape doesn’t look Dutch to me. 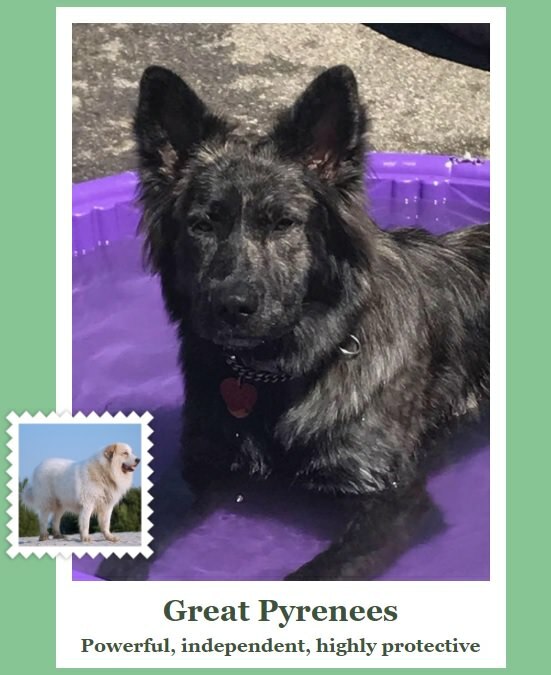 A shepherd x pyrenees mix might explain everything. Thanks for the guess, I wouldn’t have thought of that mix. I sure hope she doesn’t get up to 85 pounds - she’s almost as big as me already! Even among professionals who handle dogs day-in and day-out, the success rate of visual breed identification is 20-25%. I had to try 4 different pictures of my own dog who is confirmed through DNA testing before what-dog correctly identified the breed. BTW - DNA testing may be your best option. Wisdom Panel is ~$90 for breed id, and ~$150 for the one that includes 150+ genetic diseases testing. Also, after my post, I went back and tried more of your pictures and got a different result each time. You should try it just for fun, because one of them came back as a little terrier type dog. After all is said and done, it seems that you have a wonderful dog, but you mentioned some incidents in your introduction. What's up there? Hi, Thank you for your reply. I think I got the funny terrier match too After looking at more long-coat DS I’ve noticed that they seem to have the rounded ears vs. the pointy ears of the smooth coat. There is one DS identical to Lucy except the head shape. Maybe I’ll do the dna test at some point. You referenced incidents in my intro - are you refering to the skin problem? She was itching and biting to the point of getting raw and had pink spots and little pimples on her skin. I was feeding her a variety of foods wet and dry and dehydrated (rehydrated) because I believe in healthy variety - all high quality. So now I’m down to just dry food (against my instinct) of duck and pumpkin (Venture brand), and canned pumpkin for treats, and she’s on anti fungal, antibiotic and more frequent baths(every 2weeks) with medicated soap (chlorhexidine & ketoconazole). Her energy is great again. We’ll see when she’s off the meds. Don't rule out allergies. Radar suffers from the same exact symptoms, and after confirmation through testing, we put him on Apoquel and adjusted his food to eliminate the allergens. He's much better today. You could be right about seeing more rounded ears in the long-haired variety. I definitely see the resemblance between Lucy and the Blue heeler/cattle dog in the face. Fun to keep guessing.